Are you considering moving or visiting Oklahoma City? Whether your purposes are for business or for leisure, the city makes a great place for an extended vacation or the perfect spot to set down roots. Oklahoma City is the capital of the state of Oklahoma. It also happens to be one of the largest cities in the state and even in the country. The city has a number of things going for it. Oklahoma City offers its residents a low cost of living, breathtaking scenery, and a taste of all seasons. At National Dispatch, we understand that moving can be a challenge. This is why we offer hassle-free car shipping services. A move doesn’t have to be stressful if you enlist the help of a professional auto transport company. Learn more about Oklahoma Car Shipping. You might be wondering, “What are the advantages of hiring an auto transport company over driving a car yourself?” In some cases, driving a car presents more of a hassle and is sometimes even impossible, like with a busy work schedule or if you have more than one car. How are you going to make time to drive to your destination? What is the most efficient way to get both cars to your new home on time and safely? The answer is by hiring a car shipping company. Moving a car, yourself, can be a challenge. If you have more than one car, transporting is difficult. You will constantly be worrying whether the car is safely secured on the trailer. This may result in you making frequent pit-stops to check on the vehicle. If you have no experience hauling anything, then this can be another worry. Even if you have only one car to worry about, driving can be stressful with traffic and inclement weather. Professionals are professionals. That sounds redundant, but it is important to point out. Drivers that work for professional auto transport companies must have multiple years of experience, along with training. This makes professional car shipping companies the best option for transporting a car, whether it be near or far. There’s more time to enjoy what truly matters. We believe in making time for what matters most. Car shipping allows you to do just that. By leaving your car in the hands of a reputable car shipping company, you have more time to spend with your family on the beach, in the mountains, or simply in your backyard. Read 4 Key Benefits Of Auto Transport to learn more. Before moving to Oklahoma City, there are a few things that you must know about the place you soon will be calling home. Check them out below. The cost of living in Oklahoma is significantly less than the rest of the country, making it an affordable place to live and raise a family. It is nice knowing that you will not break the bank by paying for food, electricity, and rent. Another thing to think about when factoring in the cost of living is annual salary and unemployment rate. The unemployment rate in Oklahoma City is fairly low at just above three percent. However, annual salaries are a bit less than the national average. Since everything is a little cheaper, your dollar will stretch further. For someone who wants to experience all four seasons, but does not want to feel extreme temperatures, Oklahoma City may be a good option. Summers are hot, winters are cool, and fall is crisp and breezy. It gets roughly the nation’s average in rainfall, and well below the national average for snowfall. The only extreme weather conditions happen in Spring when heavy winds have the potential to cause tornadoes. Oklahoma City is known for having some of the nicest people around. You cannot go somewhere without being asked how your day was. If you ask for directions, most people will help take you there instead of just pointing you in the right direction. The city is starting to be known as “The Big Friendly” because of this. A favorite pastime for a lot of the people here is hunting, fishing, and hiking. The outdoors are very well loved here. Most of the people consider Bass Pro Shop to be their happy place. They also love beer, basketball and softball. 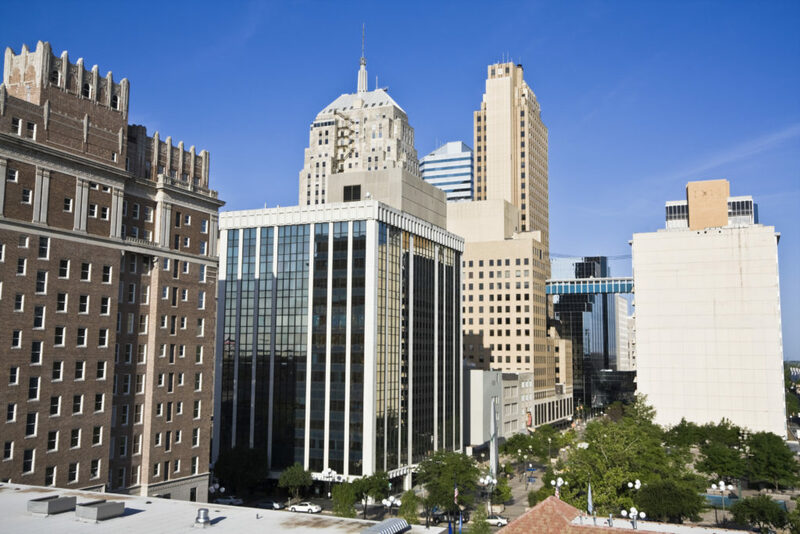 While Oklahoma City does not offer as much of a variety as New York or Los Angeles, there is still plenty of fun and exciting things to see and do in the city. Riversport Adventures Sky Trail – This 80-foot structure is both fun, exciting, and a little bit nerve-wracking. It is a six-level obstacle course that you can climb, and if you choose, zip line, slide, or jump off of at the end. Museum of Art – At the museum of art, you can view many different collections including the most comprehensive Dale Chihuly glass sculpture collection. National Cowboy & Western Heritage Museum – To learn more about what it meant to have the spirit of the wild west, check out this museum. Cattlemen’s Steakhouse – Being one of the favorite local restaurants, Cattlemen’s Steakhouse has been the oldest continuously operated restaurant in the city. The Crystal Bridge – If you are feeling like you want a tropical vacation, but you are not sure how to pay for a full vacation, just head over to the Crystal Bridge. Here, you will be able to be in a tropical environment surrounded by plants and waterfalls. National Dispatch is a nationwide car shipping company with years of experience in the industry. We have a company-owned fleet and offer a number of services to meet your unique needs. If you are in need of car shipping services, contact us today. Use our online quote form to request a free, instant car shipping quote. No personal information is required. You can also call us at 800-321-2051.